E’Tae is one of the leading manufacturers of hair care products which is Owned by Kisha Tompkins Hudson (25 years experience as hairstylist). The company is founded in 1999 to provide line of natural hair products to her daughters.The mission of kisha is to educate teenage girls and women about health hair care and how it can be done by using eta'es natural hair care products  . E’tae has been successful in satisfying its customers by providing its high quality products. By using E’tae natural products, you have minimal risks of any side effects and maximum chances of getting growing, beautiful and healthy, full of life hairs. 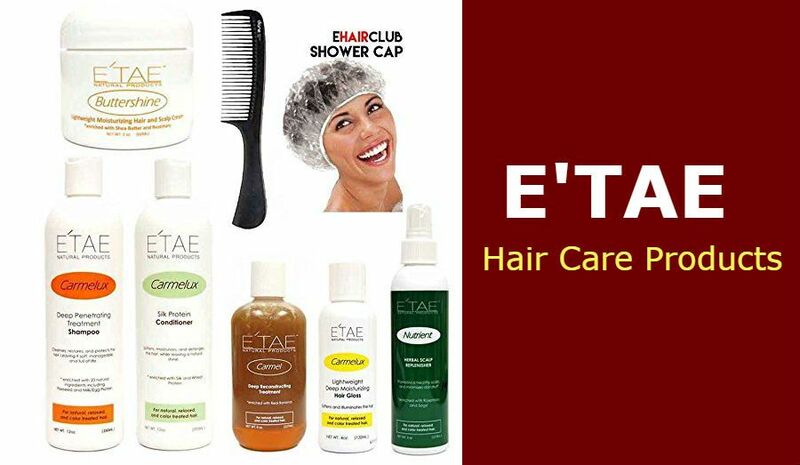 There are a wide range of Etae products vailable that can cater to the nourishment of your hairs from every aspect. Several features guided us while choosing these to 6 etae hair products. One thing we understand is that you need value for your money and should always get the best. We selected these products while considering a consumer who seeks to maximize utility. 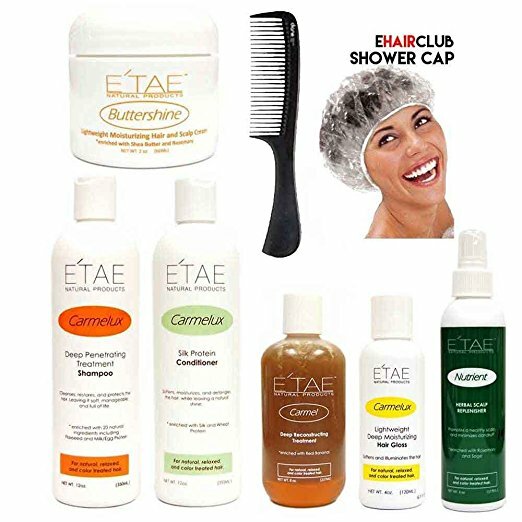 Here are some of the things we were looking at while choosing these six best etae hair care products for reviews. The fast factor we considered were the ingredients that the company uses to manufacture the hair products. Each compound in these products should help in the growth and development of your hair. We have made sure that the ingredients in these products are safe for use on your hair and scalp. In fact, all items in this review have natural ingredients. You only need to check for allergies to make sure that you will not have any reactions after applying one of these products. All these products will deliver great results with no harsh effects that come with non-natural ingredients. The other factor we looked at while compiling this list is the effectiveness of the product in meeting your grooming needs. One thing that we understand is that people have different needs depending on the type of hair. You could be looking for a product that will restore luster, promote growth, smoothen and moisturize the scalp and hair, repair damage, offer protection against heat, removing product build up, balance the scalp, provide conditioning qualities, restoring scalp PH, prevent dryness of the hair and add shine just to name a few. Our review will assist you to identify at least a hair product that will serve you well irrespective of your grooming needs. This article presents a comprehensive review that will leave no one out. Most people wish to realize the results of the hair treatment within the shortest time. The etae products we discuss in this review are highly effective. You will not wait forever to record the expected results. All these products come at a pocket-friendly price given the high levels of service delivery. This product is excellent when it comes to deep moisturizing, softening and offering maximum protection. Most people like it because it creates volume and body for the hair. One thing that will make you love the product is that it has all natural ingredients that are safe for the hair and the scalp. This natural product can restore back life irrespective of the type of hair you have. It has a high concentration of potassium, minerals, and proteins that provide nourishment to the hair. The ingredients in this product include Tea Tree Oil, Water, Apple Cider Vinegar, Molasses, Cornstarch, Olive Oil, Bananas, and Honey. The product is good for both your scalp and hair. The moisturizing and strengthening qualities that are inherent in the product will deeply soften your hair while enhancing manageability and texture to create a natural shine and body. 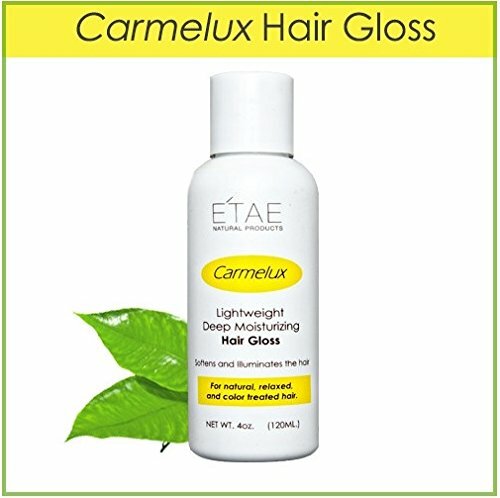 ​It’s advisable to apply the Carmel Deep Reconstructing Hair treatment before shampooing and store at room temperature. You can use as many times as you like but the manufacturer recommends that you apply it at least once every month. Any person can use this product irrespective of the age. Make sure you dampen your hair before applying the Carmel Deep Reconstructing Hair Treatment. You can then pour a palm size quantity of the product on your palm and rub it throughout the hair. This hair product is great for twist outs, go’s, braid sets, wash, flash ironing, bans, curling among other styles. It has nutritious ingredients with strengthening and moisturizing qualities. The hair and scalp absorb it with a lot of ease leaving behind a manageable, soft, and weightless hair. It’s advisable to add a drop that is smaller than a pea after blow drying for curl/flat ironing and wash blow dry, just before flat ironing/curling. For curl, twist set and braid set, add a drop of this formulae to each damp hair piece before setting. Additionally, curl and blow dry a drop to damp hair then curl and blow dry for kids wash. You should also apply as desired or needed for child protective style. This product is highly effective when it comes to softening the hair and preventing dryness. It will add a natural shine to your hair and protect is from heat. It also moisturizes and smoothens the scalp and hair and comes at a pocket-friendly price. You can apply this formula for color treated, relaxed and natural hair. This product weights 4oz, and you can find it on Amazon. It’s one of the best products if you want to maintain a healthy and natural looking hair. 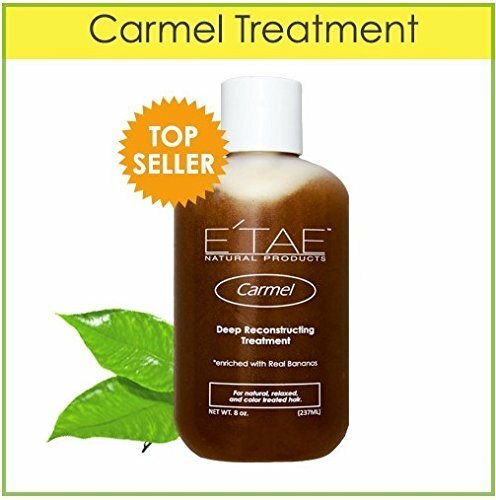 The Carmelux Deep Penetrating Treatment Shampoo is another great product from Etae. The primary advantage of this product is that it has no sulfate and offers maximum protection to hair strands. This shampoo will restore luster back to your hair and repair any damages. Most people like to use this shampoo because it promotes a healthy scalp. The shampoo also cleanses gently but thoroughly and is very effective when it comes to strengthening hair strands. It brings a natural shine to the hair and preserves and restores while cleansing. The conditioning qualities of this shampoo will manage, protect and strengthen your hair to improve its texture and condition. The shampoo is infused with essential ingredients that will encourage growth and help balance the scalp while leaving your hair feeling supple and soft with a natural shine. The shampoo has a shipping weight of 13.6 ounces and all natural ingredients. It delivers great results without the harsh effects of non-natural ingredients. The shampoo has no arterial fragrances that can strip your hair of its natural oils. Some of the ingredients in this product include egg and milk protein and flax seed oil that promote growth, balance the scalp, and provide conditioning qualities. These ingredients will leave your hair stronger and with a natural shine. 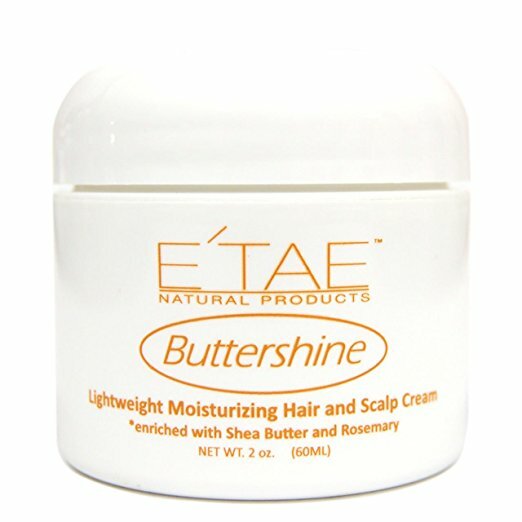 Butter Shine Moisturizing Hair and Scalp Cream from Etae is another great product you can find on the market. The cream is good for buns, braid sets, twist outs, locs, go’s and wash, flat ironing, curling and all children styles. The cream is made of Shea butter and with the healing moisturizers. The butter shine will smoothen and soften your hair strands while adding an incredible shine and moisture. It has a unique ability to absorb directly into the scalp which prevents flaking and dryness that in turn promotes a healthy scalp. It has a shipping weight of 2.4 ounces and comes at a pocket-friendly price. The cream has a protection of fat protein that will assist you to get rid of fiber damage and scalp irritation. The lightweight cream is enriched with the healing moisturizers of bergamot, clary sage, Shea Butter, and Rosemary. It also prevents dryness and adds a natural shine and moisture to the hair. It is recommended to add a drop that is smaller than a pea after blow dry for curl/flat ironing or wash blow dry just before flat ironing or curling. For twist and braid set, you need to add a drop to each damp hair piece before setting. Additionally, curl and blow dry a drop to damp hair then curl and blow dry for kids washing. You should apply as required and according to your desire for child protective style. As per the directions, you should directly smudge this cream to the hair. 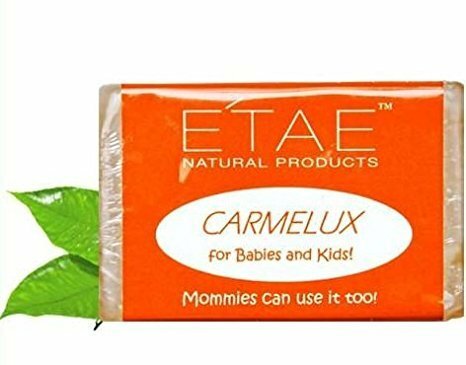 This E'Tae shampoo is applicable for infants up to 12 years of age. However, moms can also use this product. The shampoo is sulfate free and cleanses thoroughly and gently. It will also enhance the health of your scalp and promote growth. The shampoo is superb for the hair and scalp of your little ones. The unique formulae in this shampoo contain olive oil, ginger, egg and milk protein and flax seed among other nutritious ingredients. All these are natural ingredients that are safe for children use as they still have delicate skin. It also has a ‘tear free’ bar that thoroughly cleanses and detangles the hair which creates a soft and soothing feel that is manageable. The product also has antibiotic properties that assist in controlling cradle cap and dandruff on the scalp and leaves the hair of your young one with a natural shine and healthy. You should allow this shampoo to settle on the hair for at least 10 minutes if the hair had a build up before using the bar to allow the build up to dissolve. It’s recommended to store the bar in a dry place after use and not cover it with the Saran Wrap. You need to wet the hair properly, open the roots of your hair and massage well all over the scalp and hair. Rinse and repeat before you follow up with the Carmelux conditioner. 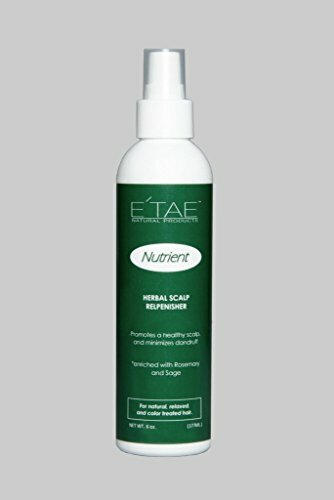 Etae Nutritional Herbal Scalp Replenisher is another excellent hair product. It’s essential if you want to restore the PH balance of your scalp. The formulae will also increase the natural shine of your hair and minimize flakiness, itchiness, and dandruff. It also cools and soothes the scalp and removes product build up. Some of the natural ingredients you will find in this hair product include sage, basil, and rosemary which helps to remove build up and restore the PH of your hair while leaving it silky and vibrant. The antibacterial properties in this product will control all forms of itchiness and dandruff within your scalp. It leaves behind clean pores and a refreshed feeling for healthier growing hair. The item comes at a fair price despite the immense benefits that come with it. You should not spray this product on an abrasive scalp or close to the eyes at it contains apple cider vinegar. You need to condition your hair after shampooing and detangle the hair while the conditioner is inside. You should then open the root hairs and spray the herbal nutrient along the scalp. This product will take good care of your skin and scalp.It also calms Seborrhea Dermatitis and Psoriasis. We recommend all these products depending on your needs. Go through each product carefully and choose one that will assist you to maximize utility. The reason is that people have different types of hairs and scalp. Whether you have a dry or oily one, you will get a product that will suit your case. We also have a product that suits the needs of children up to the age of 12 years. Read carefully and make a wise decision while shopping. The advantage is that you will get a free shower cap upon the purchase of any of these products.